This is the summary of consumer reviews for Panasonic KX-TG6512B DECT 6.0 PLUS Expandable Digital Cordless Phone System. The BoolPool rating for this product is Very Good, with 4.20 stars, and the price range is $29.98-$77.50. 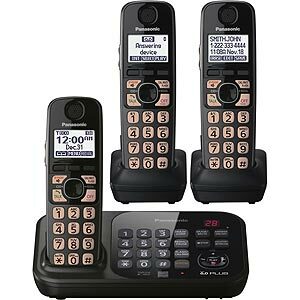 The Panasonic KX-TG6512B DECT 6.0 PLUS is an Expandable Digital Cordless Phone System (expandable up to 6 handsets), which is designed to work in 1.9 GHz frequency, providing a long range and clear sound than before. 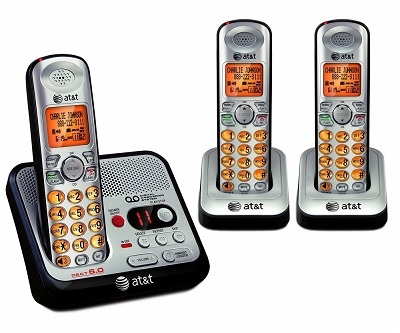 These DECT 6.0 phones do not conflict with common wireless devices such as wireless keyboards and mouse, microwave ovens, routers and/or other house hold item. 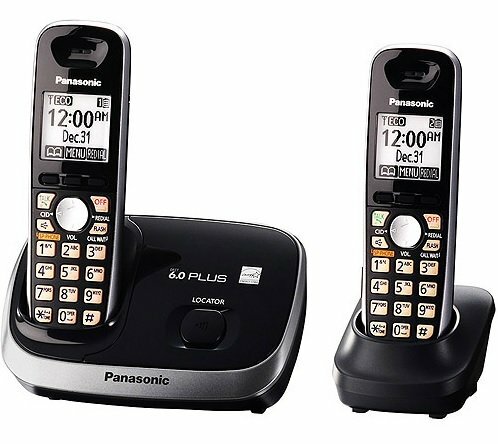 The Panasonic KX - TG6512B DECT 6.0 PLUS comes with 2 handsets and features - intercom, 4- way conference facility, integrated caller ID, call-blocking, voicemail, speaker phone, redial, silent mode, alarm clock, battery indicator etc. The phone system is also equipped with intelligent ECO-Mode that helps in low power consumption and extends battery life. The Panasonic KX-TG6512B phone comes with a large backlit LCD screen that displays date and time and big digital numbers. It stores approximately 50 contacts and the handset paging locator is an added advantage. 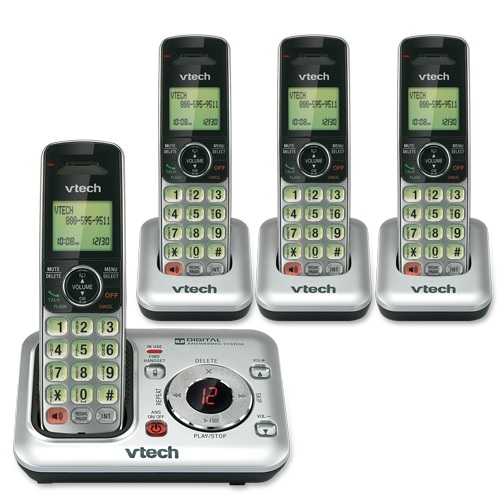 This handset is sleek, low profile base unit with reversible pedestal. The rubberized grip helps prevent slipping and the reverse side of the pedestal makes it quick and easy to mount it on a wall. This slim design makes it a perfect keep for desk or countertops as well as they do not take up a lot of space. In addition, the phone works on standard AAA rechargeable batteries for added convenience. However, as per some user reviews, the sounds quality is not at par with the features, especially for senior citizens. This phone set lacks an in-built answering machine. Some users have also experienced that the call block feature is not very handy, in some cases, it blocks the numbers from users call list and/or it does not block callers without a number. Moreover, it rings once on blocked numbers that cannot be disabled and is considered a discomfort feature by some users. Overall, the Panasonic KX - TG6512B DECT 6.0 PLUS Expandable Digital Cordless Phone System is highly recommended by users for its ease of use, expandability and enhanced quality features. Bought specifically for blocking unwanted callers. Great for caller ID (CID) and CALL BLOCK. We bought this phone mainly for the call blocking feature. It blocks 30 numbers plus, private, out of araa, unknown, any caller without a number. Bought this phone to block telemarketers. Sometimes the phone blocked numbers I'd on my regular call list. The block feature which send a busy signal to the blocked caller is also a nice feature as is the no static when the microwave is running. One of those is call block which blocks unwanted calls. I'd a Panasonic DECT 6.0, but it wouldn't block callers without a number. Doesn't really block calls: It rings once on blocked calls, and there's no way to stop that. Large display, easy to read,lighted key-pad. Nice large letter display, very easy to read. Display provides large print easy to read Easy to use and set up memory. 5) Easy to read display, with black digital font on a whitish background. The Phone is excellent, it's a Strong battery, call blocking and easy to read screen. Setup was incredibly easy......the display is large and easy to read.....the sound is as clear as a bell.....and most important to me, even after talking several hours each day, the battery is still fully charged! The quick and easy volume control is another plus for me. Setup was easy if you bother to read the directions. Bright dial screen and easy to read and large buttons and numbers. The ECO feature for saving battery life works for about 2 rooms from the base unit.Pros : Price, range, clear voice, ECO feature for long battery life. Yes, it's most features I'm looking for in a phone: Caller ID, speaker phone with good volume, good battery life, clear reception, headset input. Sound is great, battery life is good and features work well for me. I'd recommend this phone to anybody. The speaker phone feature does work great, nice and clear and loud. The intercom feature is a definite plus!. *CALL BLOCK FEATURE - If you've Caller ID through the phone company, you can choose up to 30 numbers to. Some of the features I LOVE:. The voicemail shortcut button is a nice feature. HEAD JACK : One of the most important feature. So the features included are: Call Block/Silent Mode, Intelligent ECO Mode, Non-Slip Handset Design, and Smart Wall Mount. Call quality is excellent and they use standard AAA rechargable batteries. The first set worked fine for a couple of weeks and gradually the sound quality deteriorated. I work at home quite a bit and spend a lot of time on my land-line, so the ability to use a hands-free headset with the Panasonic phones (which all have headset jacks and belt clips) has been a godsend. 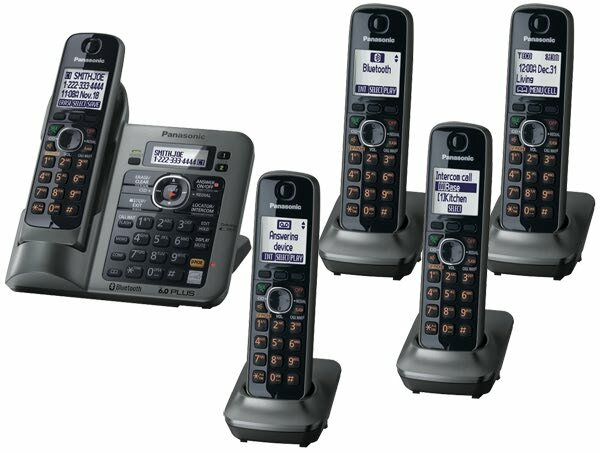 As replacements for older Uniden cordless models, these Panasonic phones feel better to the hand, have larger easier to read numerals and display screens and are intuitively programed. First I thought it was the headset, so I replaced that 2 - 3 times. 3) Panasonic has improved the caller ID and redial features from their previous generations - both features are now much easier to access. Display can be set to have a larger font for easier viewing of time, etc. Really long battery life compared to other phones I've used!. 5) These phones use standard NiMH AAA batteries, so they're easy to replace, or even to charge outside the phone if you want. Anyway, the main problems we run into with phones are typically sound quality and durability. Purchased these based on customer reviews and the need to replace an older Uniden set, with key pads that finally went defective!! The speaker phone works great. It works better than expected!. Next day, phone started working. phone worked fine only flaw is the volume, seems low. Phone works very good, has very good sound and contrary to another review, has an earphone plugin which works well. this phone works great, also purchased additional headset. I bought this phone expecting to use the jack for the headset and works really good. SPEAKERPHONES ON BOTH UNITS QUIT WORKING AFTER 3 MONTHS AND PANASONIC REFUSES TO REPLACE THE PHONES.